Lang Magnetic Spark Plug Socket features a magnet that firmly holds the spark plug for easy installation and removal, avoiding the chance of dropping and damaging the spark plug. Unlike sockets with rubber inserts, the permanent magnet in the Lang Magnetic Spark Plug Cable will not wear out or be damaged by exposure to oil or humidity. Lang Spark Plug Terminal Pliers. Safely remove spark plug cables and prevent cable damage. Pliers handles and jaws are coated with heavy-duty plastic for a sure grip. Lang Magnetic Spark Plug Socket. 5/8 diameter, 3/8 Drive. Magnet firmly holds the spark plug for easy installation and removal avoiding the chance of dropping and damaging the spark plug. Lang Magnetic Spark Plug Socket. 13/16'' diameter, 3/8 Drive. Magnet firmly holds the spark plug for easy installation and removal avoiding the chance of dropping and damaging the spark plug. Lang Harness Connector Release Tools. For disconnecting electrical connectors. Heattreated blades with E-Z Grip handles. Set includes one tool designed for pulling connectors off, and the other for pushing connectors off. Lang Spark Plug Extractor Tool. Removes broken spark plugs from the cylinder head on Ford Triton 4.6L, 5.4L, and 6.8L 3-valve engines without removing the head. Lang Master Power Steering Pulley Remover And Installer Set. Designed to remove and install press-on type belt-driven accessory pulleys found on most major domestic vehicle platforms. Includes components to use on pumps with 3/8-16 threaded shaft. 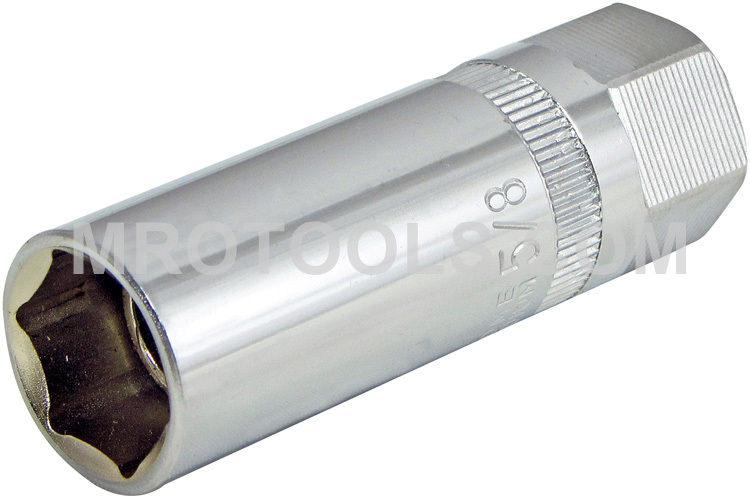 The 528 Lang Magnetic Spark Plug Socket is one of thousands of quality tooling products available from MRO Tools. Please browse Lang Automotive Pulley and Spark Plug Tools for tools similar to the 528 Lang Magnetic Spark Plug Socket. 528 Lang Magnetic Spark Plug Socket description summary: Lang Magnetic Spark Plug Socket. 5/8 diameter, 3/8 Drive. Magnet firmly holds the spark plug for easy installation and removal avoiding the chance of dropping and damaging the spark plug. Quantity discounts may be available for the 528 Lang Magnetic Spark Plug Socket. Please contact MRO Tools for details.